One of the most delightful moments in a Christmas kitchen is opening the oven door and wafting through is an incredible aroma of baked bread! 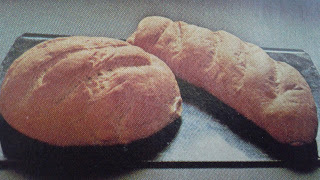 On our 11th Day of of Christmas Recipes we have White Crusty Loaves! Put into a large bowl the flour, salt, sugar and yeast. Make a well in the centre. Combine the lukewarm water and oil, pour into the dry ingredients. Beat well with a wooden spoon until most of the flour has combined, then mix with your hands to form a dough. Knead on a lightly floured surface for 5-8 minutes, or until dough is smooth. Put the dough into a lightly greased bowl, turn dough once so that top is greased. Cover with a warm damp cloth, or greased plastic film, or enclose the bowl in a plastic bag. Leave in a warm place until dough has doubled in bulk. Punch your fist in centre of the risen dough and draw edges to the centre, to form a ball. Turn onto a lightly floured surface and knead for about a minute. Divide into halves and shape as desired - rounds, ovals etc and place on a greased oven tray. Or, put each half into a greased tin. Brush top of each with a little warm water and leave in a warm place to rise again. Brush top of each with warm water or mil and bake in a very hot oven for 30-35 minutes, or until loaves sound hollow when tapped on base and sides. Pair with some scrumptious food accessories such as butter and jam, fresh prosciutto, cheese and on an on! Straight from the oven.... Too delicious! Don't forget to watch all the live recipes from Cocina de Mama on YouTube!